Singapore grand prix at the Marina Bay is one of the more glamorous races in the F1 calendar with it’s night race providing spectacular views across the city. There are no special offers available for the 2019 race. General admission or ‘walkabout’ tickets start from £286 for a 3 day weekend ticket. Race day only tickets are £200. There are 3 zones for grandstands. Zone 1 starts from £725 for a 3 day weekend ticket with a choice between Pit, Turn 1 or Turn 2. Or you can pay £838 for a seat in the ‘Super Pit’ grandstand. Super Pit gives you great views of the race, the team garages and the starting grid or finish line. Super Pit buyers will also have priority access at Gate 1. Zone 3 consists of the Bay grandstand on the waterfront stretch is a signature feature of the Singapore Grand Prix costing you just £168 for a 3 day weekend ticket. Zone 4 starts at £281 and is located between Turns 7 and 8. The Stamford Grandstand has excellent views, including the cars negotiating multiple turns through Memorial onto the Nicoll Highway. All tickets are 3 day weekend tickets except single day Pit Grandstand tickets. Walkabout tickets provide General Admission standing entry. Amber Lounge – A VIP nightlife experience not to be missed. The Amber Lounge follows the Grand Prix calendar around the World. Events are attended by many of the F1 drivers as well as film stars, musicians and models. Prices from £380. The Green Room starts – The Green Room has an open bar with an all-day international food menu. It also provides a great viewing platform so that you can enjoy the races in luxury. Prices from £2428 for the weekend. The Club Suite – Provides shared or dedicated tables and a suite situated on the pit straight – there is also an indoor glass-fronted dining suite with a private bar. Alternatively the outdoor viewing area is at the front of the suite. There is also a 5 star menu including reception, dinner and light supper. Prices from £3534 for the weekend. The Paddock club – Includes prime viewing from the pit building, access to dedicated grandstand, exclusive pit lane walkabouts, an open bar, gourmet dinner and light supper, entertainment, a spa and hospitality parking (if requested). All this and much more, The Formula One Paddock club truly is an experience in itself. Prices start from £5457 for a weekend ticket. We’re in contact with a number of the Formula 1 Hospitality providers. If you want to enquire about package availability and offers, please use the contact form by clicking here and we’ll see what’s available. No changes as of July 2017. 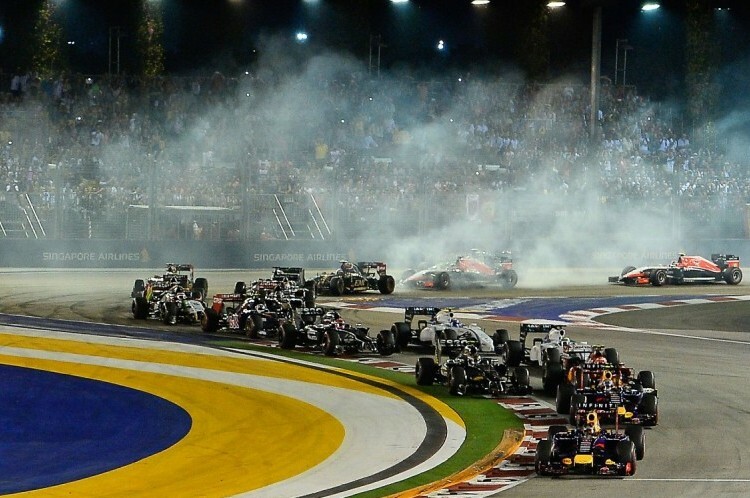 The Singapore Grand Prix is now well known for it’s star studded concerts. For 2017 a number of acts will be performing around the Marina Bay circuit. Some acts will rotate between stages on alternative days. The Village Stage is located in Zone 1 and only available to Zone 1 ticket holders. The Esplanade Outdoor Theatre and Downtown stages are smaller stages located in Zone 4 and is open to all. Neo-jazz artist Lianne La Havas will be performing on the Friday at the Padang Stage and on Saturday on the Village Stage. American Pop Singer Ariana Grande will take be at the Padang stage on Saturday before qualifying. Duran Duran will perform at the Village Stage on Saturday and the Padang Stage on Sunday. Exclusive to Zone 1 ticket holders – Singer-songwriter Seal will perform at the Village Stage before the race on Sunday. American pop-rock group Onerepublic take to the stage and kick off the entertainment on Friday evening. Saturday will see the DJ duo The Chainsmokers with a full-length concert. To celebrate the 10th anniversary of the Singapore Grand Prix, DJ Calvin Harris will play a full set at the Padang Stage on Sunday after the race.